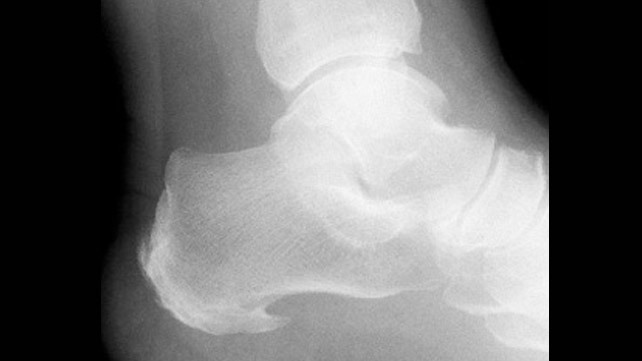 A heel spur is the formation of a bony hook that forms on the calcaneal bone in the heel, and can be rather painful. Unfortunately, this condition can be similar symptoms-wise to plantar fascitiis but they're not the same at all. (Heel spur is a bone-related condition of the calcaneus bone whereas plantar fasciitis is related to the plantar fascia, a soft-tissue). Heel spurs happens when calcium deposits build up on the underside of the heel bone, a process that usually occurs over a long time. They are often caused by strains on foot muscles and ligaments, which stretches and strains the plantar fascia, and repeated tearing of the membrane that covers the heel bone. Unfortunately...heel spurs are especially common among athletes whose activities include large amounts of running and jumping. Heel spurs by itself usually doesn't lead to any symptoms. BUT heel spurs can be linked to intermittent or chronic pain - especially pain, discomfort or aches in the heel while walking, jogging, or running if inflammation develops at the location of the spur formation. Generally, the cause of the pain is not the heel spur itself but the soft-tissue injury and inflammation around and associated with it. Many patients often describe the pain of heel spurs and plantar fasciitis as a stabbing knife or pin sticking into the bottom of their feet when they first stand up in the morning, and this pain gradually morphing into a dull ache later in the day. Patients also report that the same sharp pain returns after they stand up after sitting for a prolonged period of time. Physiotherapy treatments of heel spurs are very similar to physiotherapy treatments of plantar fasciitis. Before any treatments can start, we first need to diagnose (differential diagnosis) to tell if it's plantar fasciitis or heel spur. Joint, Muscles & Soft Tissue Management: using a combination gliding, stretching, positioning, manipulation to decrease tightness, stiffness and decreased range of motion to increase range and natural movements. We may also employ deep tissue release to release tight knots in muscles. Taping: Taping (eg using Rocktape) has been clinically and research-proven to be effective for plantar fasciitis and heel spurs management. The taping spreads out force and load for the plantar fascia.